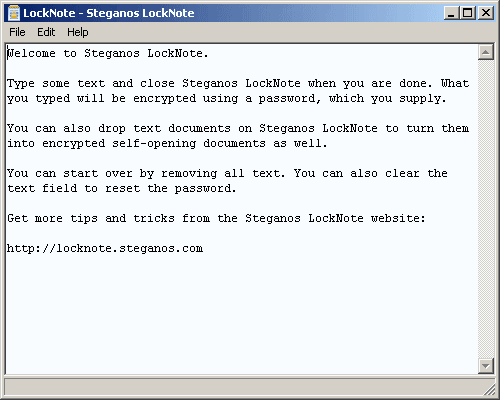 LockNote works in two ways: it is a notepad that encrypts everything you put inside and also creates copies of itself when you drag-drop a text file into it. You end up with a new EXE that displays the content of that text file when run using the correct password. How to extract: Download the ZIP package and extract to a folder of your choice. Launch LockNote.exe. Changed default font to Lucida Console to avoid 1/l - O/0 confusion. Font typeface can be selected (Arial/Courier New/Lucida Console/Tahoma/Verdana). Font size can be selected (9/10/12/14). LockNote saves window size, font size and font typeface. Find Dialog: Enter/Tab/Escape/Space/Ctrl-V keys work. Find Dialog: Message displayed if search string is not found. Find Dialog: F3 brings up Find Dialog or finds next result. It would be nice if LockNote will have an option to increase font sizes. For everyone still using this, be aware that version 1.0.5 still has some bugs. "Locknote has a clean simple design. I would be very useful if not for a fatal bug where it occasionally fails to save changes. There is no error message or any other indication that it has failed. I have had it working perfectly for a long period of time and, for no reason, suddenly stops updating changes. If I use "save as" to create a new file, it will continue to work but will eventually fail again for no apparent reason. " "Be careful - LockNote silently fails to save data. You can tell by watching the Modified timestamp ... when it fails it doesn't change. I lost critical banking login details. I am using KeePass now, which isn't great for handling text but at least it is reliable." If you still want to use this, make backups when updating the content and always check if content is saved properly.